Realm of Horror - News and Blog: Death House, Puppet Master, & Sleepaway Camp apparel available from Terror Threads. 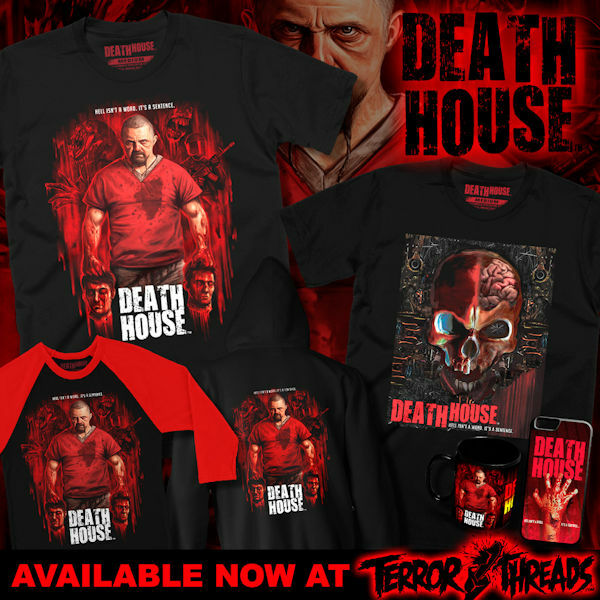 Death House, Puppet Master, & Sleepaway Camp apparel available from Terror Threads. With the holidays right around the corner, Terror Threads is making shopping easy for horror fans. The company has new apparel from Death House, Puppet Master, and Sleepaway Camp. Terror Threads has released a pair of Death House designs on T-shirts and baseball tees. The highly-anticipated horror film stars genre icons Kane Hodder, Dee Wallace, Sid Haig, Bill Moseley, Barbara Crampton, Tony Todd, Michael Berryman, Felissa Rose, and Adrienne Barbeau. Terror Threads also has a variety of designs dedicated to the long-running Puppet Master franchise. Fan favorite puppets Blade, Six Shooter, Leech Woman, Jester, and Pinhead each receive their own shirt, plus a design featuring all of them. Last but certainly not least, Terror Threads' faux-knit Christmas sweater-style designs featuring Puppet Master and Sleepaway Camp make the perfect holiday party wardrobe. Death House, Puppet Master, and Sleepaway Camp merchandise is on sale now at TerrorThreads.com, where you'll also find apparel and accessories from many more horror classics.